DosBox supports, almost all the game classics we used top lay in oldschool times when DOS (Disk Operating System ) version was running on top of most personal computer. The most spread versions of DOS people used to use on their PCs were Novell (DR-DOS) more rarely used, and MS-DOS (The Microsoft DOS ver.). 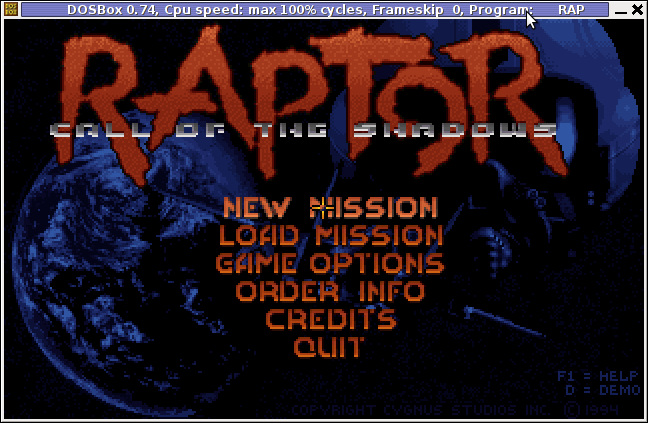 I'm sometimes being sentimental about the past so I remembered for Raptor – Call of the Shadows ! Having a bit of experience with DOSBox to run few DOS games I've decided to give a try with dosbox. First I have to dig for this shareware, since this game is part of the sharewares, nowdays a binary version of it is freely distributed on the net. Finding the game however took me about 10 minutes, as most of the download links for Raptor, were either dead or required some kind of registration. After a bit of look I found it on an old torrent with few seeders and succeded downloading. 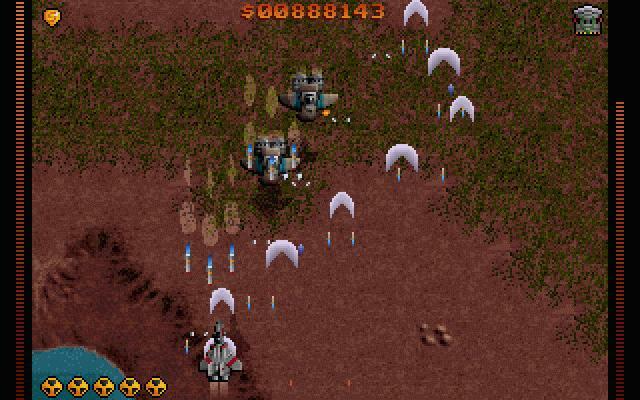 Nicely Raptor works out of the box directly launched with dosbox emulator. Dosbox has packages for most Linux distributions. 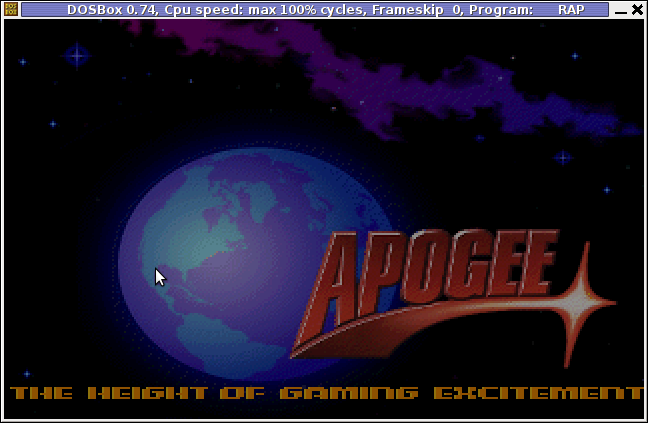 Apogee until this very day remain one of the greatest game creation companies in history of games. 3D Realms played a crucial role in development of PC game industry as well as has a great santimental value to probably million of old school arcade game addicts. They can be ben undoubtedly can be praised for having created some of the most awesome arcade games for all times. Apogee was also notable for being a company to had established the so spread mostly during the late 80s up to the early years of the second millenium. ShareWare model of distribution is an interesting phenomenon, that co-relates more or less with the ideas of Free Software. The idea of ShareWare games was games are distributed for Free and the end customer (gamer) is asked to pay for a game only if he likes it. Some of the shareware published games was available for free download and play, however the game was only bundled with only a number of game levels to unlock the rest of the game levels you had to play some money. The shareware games produced were then freely published and shared via dial up access BBS nodes (A text based Bulletin Board System similar to nowdays Forums). BBS has historically been the major way of sharing knowledge and exchanging ideas and opinions preceding the massive rise of the WEB. Today most computer users would probably even haven't heard about BBS, if you like to have a general idea on how BBSes seemed to look dahmer.vistech.net . ShareWare started to loose speed with the decline of BBS and the emergence of Free Software. Some of the conceptual ideas of ShareWare found its way in "Open Source & Free Software", and commercial companies like RedHat and SuSE.